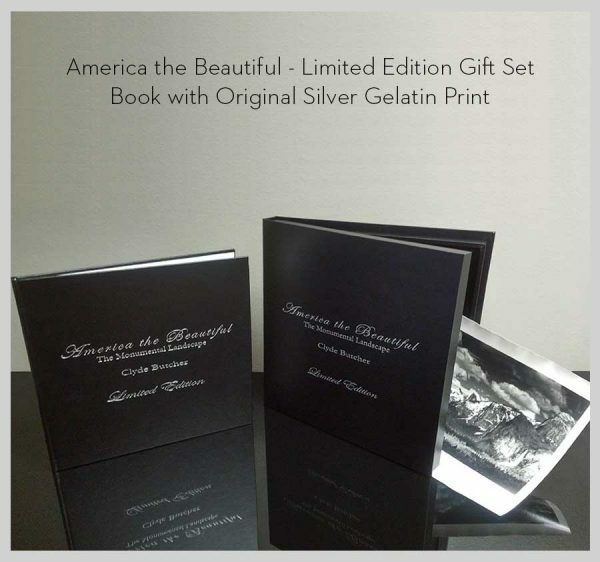 The gift set includes: Inspiration Point 148 at Yosemite Valley, an 13″ x 9″ signed and numbered silver gelatin fiber base photograph, and a limited edition America the Beautiful: The Monumental Landscape book. This signed, limited edition book and its slip case are black leather bound and silver embossed, measuring nearly 14.5″x 13.5″. Inside, you will find 90 pages of Clyde Butchers large scale black and white photographs. This stunning gift set, an homage to our country’s epic landscapes, is only an edition of 125. Please don’t miss your chance to share this with your loved one, a nature lover or important business contact.